The Basics (spoiler free): I did not want the hours of my life back. However, there were scenes where I audibly groaned or yelled, “Oh, puh-lease!” The movie did a good job of portraying the world of the Shadowhunters, and the action scenes were tense and interesting. The movie was fairly true to the book, but the changes that were made ranged from mildly irritating to one that was downright infuriating. Most of the cast was great. Just so you know where I’m coming from, I have read all of Cassandra Clare’s wonderful books in the Mortal Instrument series as well as the Infernal Devices prequels. I was excited about the movies, and would say I went into the movie with reasonable expectations. I know that movies will never be the books. Screenplays are usually about 120 pages, so they are never going to be as rich as the book itself. This outlook allowed me to enjoy the Harry Potter movies and the first Hunger Games. On the whole, the casting decisions were great. 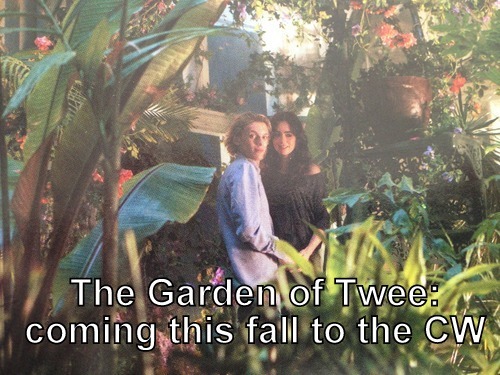 I was particularly pleased with Jamie Campbell Bower’s Jace. I had some mild reservations about him playing Jace, and my friend who went with me had been lamenting JCB’s casting for months, and she also freely admitted that he was perfect as that character. 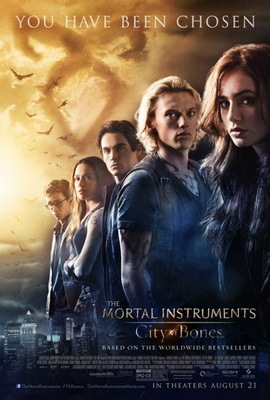 I felt Lily Collins represented Clary well, and Robert Sheehan was a breakout as Simon. The notable exception to the otherwise impressive cast was Godfrey Gao as Magnus Bane. Gao has a great look for Magnus, but the man cannot act. You know how sometimes SNL will have a host who’s an athlete or a musician instead of an actor, and it’s just painful to watch sketch after sketch? Yeah, it was like that. Thankfully, Gao was only in two scenes, but I winced my way through both of them. As Magnus is the only character in all of Clare’s books, I think a recast might be in order. Every single one of her books has been optioned, including the Shadowhunter books she hasn’t even written yet. That’s a lot of bad to have to sit through although one would hope Gao would get better by the twelfth movie. Other than Gao, the most offensive parts of the movie were, not surprisingly, the parts Hollywood added in for no reason that I can ascertain. There was an unforgivably bad storyline about how Bach was a Shadowhunter. If you play his music without passion, you can irritate demons enough to show themselves. Even my friend who had not read the books found this so ridiculous that he covered his face with his hands and groaned. 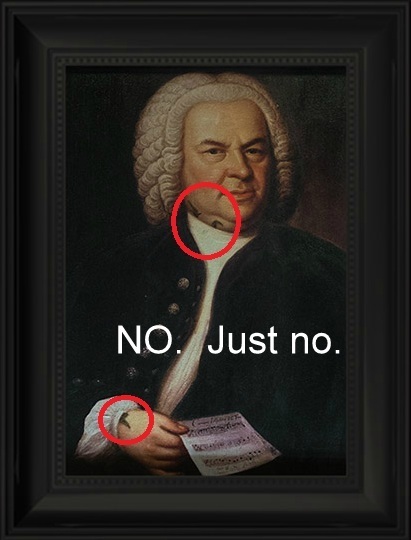 The film even shot to a portrait of Bach in his puffy wig where you could see the dark runes peeking out of his collar. Ugh. I assured my friend that none of that nonsense was in the books. Another particularly horrible scene was the one in which Jace and Clary kiss. This is a moment that I’m sure all fans of the books have been waiting a long time to see play out on the big screen. If you are twelve, then maybe your expectations were fulfilled. They were in a garden. Fine. 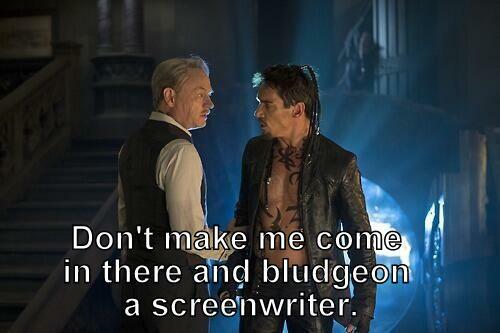 Then the dialogue got awful, the kind of sap that Jace would have mocked in the books. Then—I am not making this up—suddenly there were little twinkly somethings everywhere. I don’t even know what they were. Fireflies? I’m praying they were witchstones to at least stay with the plot somehow. Then the music (which was pretty awful throughout the movie) swelled with something way melodramatic, AND THEN it started raining AND THEN flowers burst into bloom everywhere. They kissed! Eeee! And I threw up a little bit. I feel I must point out, though, that part of why those two scenes stood out so much is because for most of the movie I was quite happily absorbed in the world of the Shadowhunters. All of the fighting scenes were good. The demons were appropriately creepy and gross. As out of character and stupid as the kissing scene was, the one that followed it where Jace makes a snarky comment about Simon being in Clary’s bed was spot on. There were a number of other changes or cuts that even if I wasn’t thrilled about them, I did understand. Alec came off as a little stilted, and Magnus and his storyline was hardly touched. Neither was Simon and Izzy’s initial tension. In fact, poor Izzy didn’t get much in way of development. Alec and Izzy’s parents aren’t even characters, nor is Max. Simon’s run in with the vampires is much abbreviated, as is all of the Daylighter stuff and his struggles with his faith and mother. The Silent Brothers, City of Bones, and the Clave were touched on so briefly that my friend who hadn’t read the books didn’t really follow most of it. He also never made the connection that Luke was a former Shadowhunter. All of those things I can forgive—maybe even Jonathan Rhys Meyers’s ridiculous dreadlocks. The movie was trying to fit a dense book with a very complicated world into two hours. You have to pick and choose what you focus on. I felt the screenwriter made the right choice by initially focusing on Clary and her relationship with her mother/Luke/Valentine and Jace/Simon. Everyone else can be fleshed out in subsequent movies. What the movie did that was unforgivable was reveal a major plot twist that isn’t sorted out until a few books later. Not only did the screenwriter divulge the secret, she did it as a casual aside between Hodge and Valentine. That’s right sports fans, Hodge says almost as a throw away, “Lie to them and tell them they’re related.” Oh no, I will climb over these theater seats into the screen and throttle someone for that. Not only did you just ruin a major tension between Jace and Clary for the casual moviegoer, but then the movie also immediately proceeded to confuse the issue even more. By implying that Jace was given false memories, my friend who hadn’t read the books did not understand that Valentine had actually raised Jace. That abusive relationship explains so much of Jace’s future actions. So the first Mortal Instruments movie was definitely a mixed bag. I think it did more right than it did wrong, but when the movie screwed up, boy did it screw up. Thoughts? If you read the post this far, I’m assuming you also read the books. Are you planning to see the movie? Why or why not? If you already saw it, what did you think was done well? What could be improved for the next movie? I agree with everything that you pointed out. 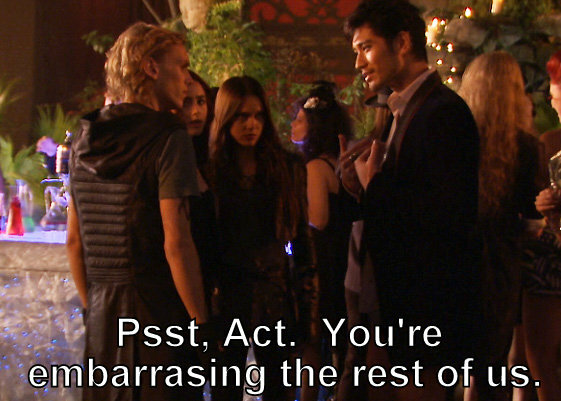 Though, I’d like to mention that Godfrey Gao’s acting was stiff because he was hiding his accent. I don’t think the blame should fall entirely on him. He is actually a pretty good actor, but whoever was in charge decided to burden him with extra speech lessons that he didn’t need. His accent is barely audible and would have actually brought Magnus’ character to life, since Magnus technically isn’t a native English speaker himself. I really hope they drop his dialect coaching, and let him act more freely in the next movie. I feel a little biased for saying all this, since I am a Godfrey Gao fan, but I honestly believe that this movie did not portray his true acting abilities. Though I will admit that his acting was pretty *ahem* piss poor in this particular movie.. This is also his first English speaking role, so his acting was probably strained because of his nervousness? I’m keeping my fingers crossed for the next one, hopefully he’ll be able to properly demonstrate his acting skills. What is Gao’s native language? I didn’t realize they were going ahead with a second movie since the first one was such a failure at the box office. What were your thoughts on the ending scenes? Particularly the ending battle scene, which rather than being set on Roosevelt Island, was held in the Institute. In the books, the Institute is hallowed ground, and thus impossible for demons to step foot on; in the battle between the werewolves and Valentine, his defense were the Forsaken. Because without the mortal cup, it was impossible for him to control the demons. We know from the books that he did conduct experiments, but not on himself, but rather his unborn children. Also another plot point that annoyed me immensely, was the portal. Rather than being glass, which shatters and plays a part in the next book, Valentine falls through to an unknown location, without the mortal cup, and the portal explodes. A portal that does not exist within the Institute. I completely agree with you about the fact that there is a limited time frame, and they cannot include every detail, but these are some major plot points that I feel we’re necessary. But I recognise that every reader has their own imagination, and would envision their world differently to myself. I’m just curious as to your opinion on the aforementioned points. I didn’t much like them, either. The portal, in particular, annoyed me as well. In books/shows with magic there are rules and complicated mythology for a reason. It helps bring balance back after you have given great power to a character or group of people. If you don’t keep the rules, you lose the balance, as well as any sort of stakes. One of the things that most irritates me when Hollywood tries to do a genre film is they throw out any rules/mythology that are inconvenient to a particular scene or visual and expect there to be no consequence to the storytelling. You can’t suddenly ignore the rules about demons, the Mortal Cup, or portals and not expect to trip over your own inconsistencies.